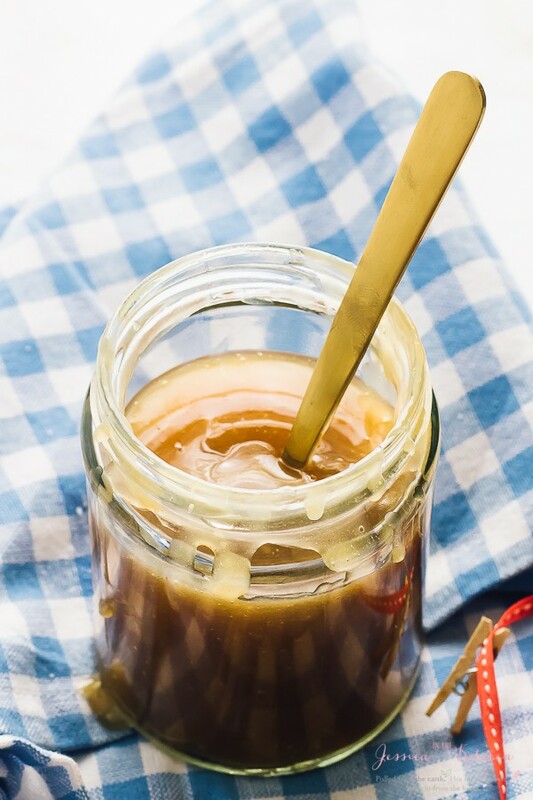 This Vegan Caramel Sauce is made with only 3 ingredients! Healthier, all natural ingredients, and goes perfectly with everything you pour it over!! The Christmas season means many things. Several viewings of Elf. Lots of eggnog and hot chocolate drinking beside the Christmas tree. Most prevalent it seems, is the lots of sweets – and I mean lots. ‘Tis the season for overindulging in sweet things! 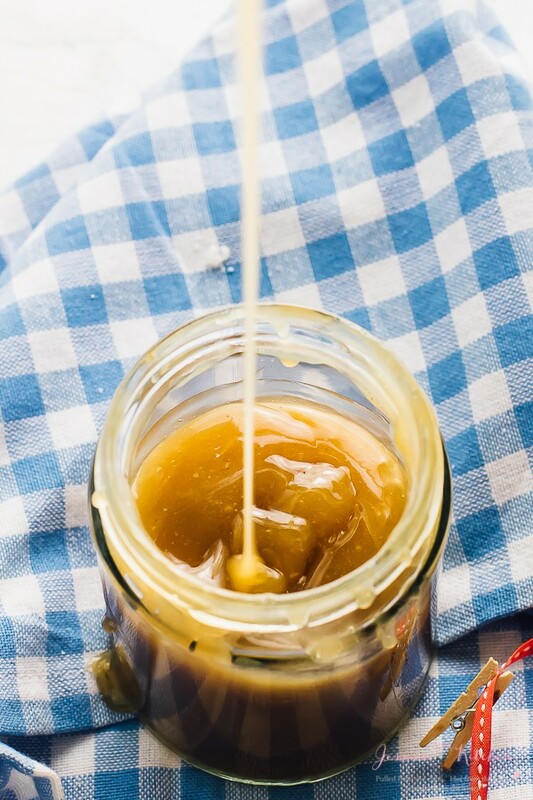 So when you feel like you’re in need of a sweet craving this holiday (you will), make this Vegan Caramel Sauce. Easy, creamy, thick and dreamy. Also? All natural ingredients, way healthier than store-bought caramel, and so incredibly easy to make, you’ll definitely make it more than once. So, what exactly is this Vegan Caramel Sauce made up of? All natural sugar of your choice. That can be coconut sugar, cane sugar, organic brown sugar, sucanat, date sugar. Honestly, the possibility are endless. This recipe is so customisable that it’ll fit your every needs. Next on this list is the coconut milk. Yes, I said coconut milk friends. It helps to get the caramel thick and creamy, while keeping it vegan. There are a million amazing things to say about coconut milk but I’ll stick to one for right now: perfect heavy cream substitute. Lastly, sea salt. It’s that pinch that helps to elevate all of the previous ingredients. I added only a ¼ teaspoon, but feel free to add up to ¾ teaspoon of sea salt if you desire a salted caramel. Salted caramel really is the best. I wanted to keep mine neutral so that you could alter it to your liking. Q: Can I add anything else to my caramel sauce? A: Yes! You could add vanilla extract, or scrape a vanilla bean for a heightened flavour. You could also add ground lavender, or even use fleur de sel instead of sea salt. That last one sounds divine! Q: What can I use this vegan caramel sauce on? A: You can use it as fruit dip. You can drizzle it over pancakes. You can stir it into your coffee or oatmeal. Even your batter for muffins or cupcakes at the top for a sweet swirl. You can use it in this Salted Pretzel Caramel Bark. The possibilities are endless! 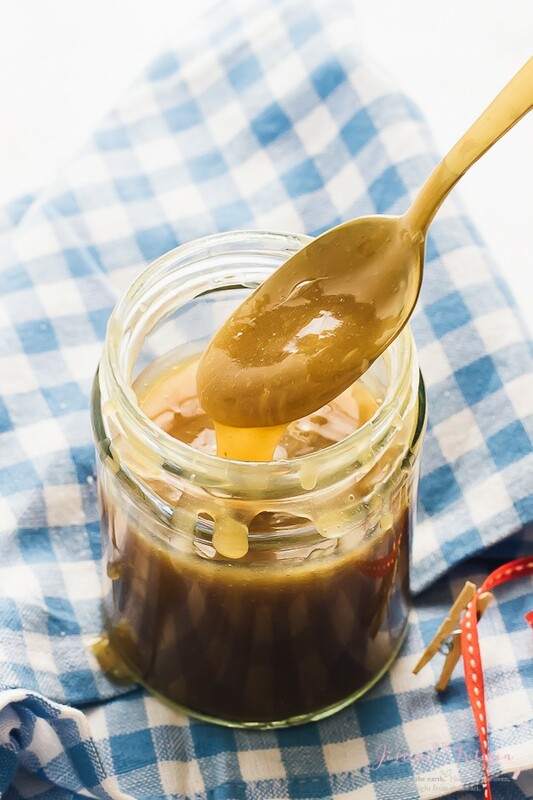 If you try this Vegan Caramel Sauce please let me know in the comment section below, or tag me on instagram with the hashtag #jessicainthekitchen! For more exclusive recipes follow me on Instagram AND on Snapchat: jessinkitchen. Heat a pot over medium high heat. Add the sugar and stir around the pot for about 1 minute to heat through. Add the coconut milk and and sea salt stir to combine. Bring to a boil. Reduce to a simmer at low medium heat and let simmer for about 15 minutes, until caramel has thickened, stirring occasionally. It should be sticking to the back of your spatula or spoon. You can stir in up to ¾ teaspoon extra sea salt at this point if you want salted caramel. Cover jar, and place in fridge to cool further for at least two hours. The sauce WILL thicken up much more upon cooling and also upon placing in the fridge, even if it doesn't look very thick after removing from the stove. To use, simply remove from fridge and pour over anything you want. I use this for holiday pancakes, Salted Caramel Pretzel Bark and over ice cream and cakes. Enjoy!! You can easily half this recipe, or even double it! Ensure that you’re using all coconut milk and not coconut water, else the sauce will not thicken up as much, and it will separate while cooling. This sauce lasts weeks in your fridge. This is beyond delicious! Fat content of the coconut milk you used? Thanks Angie!! I actually used regular coconut milk, not full fat! I imagine full fat would probably taste even creamier, though! I should clarify! I used regular coconut milk from the tin, not the carton box! I tried it again with full fat and definitely making it with that from now on! Just as tasty, but definitely creamier! Watching Elf several times is essential during Christmas!! And this caramel sauce … holy moly I want some! Thanks Ashley!! It was so yummy and YAY to Elf! Allergic to nuts and coconut. Any suggestions?? So frustrating sometimes. I miss caramel. Hey Helen! I’m assuming you’re vegan else you could make this with regular milk. I’ve been searching for ages trying to find a solution for you. The date caramel in this recipe looks promising: http://mygoodnesskitchen.com/vegan-caramel-three-ways/ just use brown rice milk instead of almond milk! I really hope that helps! I’ll let you know if I find anything else. If you simmer the dates on low heat for a long time, when you process them, they’ll be glossier. Give you a better result. Although, question, is someone with coconut allergy not allergic to dates, as they’re the same family? I would try seeing if you could just use Brown Rice Syrup and vanilla. If it needed thickened, you could also perhaps trying using a TBS or two of sunflower butter (not nuts). I would think that would make an amazing caramel sauce. If you’ve never had Brown Rice Syrup, right out of the jar it tastes almost like a caramel (without the vanilla). I will definitely be making this! Thank you! If you use the full can of coconut milk, will you also need to add more of the other ingredients? Yes! A full can of coconut milk is about 1 1/2 cups, so you can increase the sugar by like 1/4 cup. Just ensure it’s ALL full fat else the caramel won’t get as thick. I hope you enjoy!! Hi I made this recipe and came out tasting great!,but the problem is that the sugar kept on crystallizing while it was cooling down, I tried reheating it again and it stopped crystallizing but as it cooled it crystallized once again:( I put it in the fridge and checked on it to see that it was all crystal:( did I do anything wrong what should I do? I’m glad you enjoyed the taste! That’s so weird re the crystallising, it hasn’t happened to me on the occasions I have made this, but it sounds like you may have left it on a bit too long or too high heat (instead of at simmer). Did you use the same ingredients in the post? Reheating it would actually encourage more crystallising which may have just made it worse. I don’t think you can fix it at this point, but try leaving it out on the counter for a few hours. I hope that helps! It may be easier to just make it over since the point of crystallisation sounds way past the norm. Thank you for sharing your beautiful recipes. I used to make a caramel sauce and it included butter. Would vegan butter work in this recipe or does it have too much water? Aww thank you so much!! Vegan butter instead of coconut milk or in addition to it? I’m using coconut milk but it doesn’t thicken what so ever. Am I doing something wrong? Hi Hannah, how long have you been cooking it for? Did you use full fat coconut milk from the can (it’s kind of thick) or from the box? I appreciate this recipe. I just made the sauce and will be incorporating it with a batch of ice-cream. I did make some tweaks, but gratefully used your recipe as inspiration and as a reminder that I didn’t forget the basics of caramel. I heated 5 Tbsp Earth Balance until it was bubbling but not burning (at this point I also started to stir). I then added the sugar and incorporated it well into the fat while stirring. I continued stirring as the fat and sugar boiled until I started to get a light wisp of burnt sugar in the air… at that point I added full fat coconut milk mixed with .5 Tsp salt and a Tbsp home made vanilla extract. I then let this boil for a few minutes while emulsifying it with a steady whisking. Now it’s cooling, tastes delicious, and is everything caramel is supposed to be. Love your changes, sounds great!! So glad you enjoyed and your welcome! Perfect yummy sauce. I used it for the pineapple gooey topping of a vegan pineapple upside cake. Oh I’m so happy to hear that Gail! That cake sounds amazing!! I haven’t tried it but it should, as long as it’s made of a sugar like crystal texture and not a powder. Please let me know and I hope you enjoy it!! Thanks so much for your feedback Sue!! SO happy that you enjoyed it! Mmmm coconut milk lattes sound DIVINE! Did your recipe and replaced sugar by maple syrup. It is AMAZING!! Had to boil it a bit more though. Thanks for your recipe! Oh yay!! I’m so happy you enjoyed it!! I’m so happy to hear it worked with you maple syrup – thanks for your feedback and you’re so welcome!! How many weeks does this last in jars in the fridge? I’m considering this a Christmas gifts. Mine lasted several weeks – I finished mine after about three weeks in the fridge. Hope that helps! Hope these make delicious Christmas gifts – what a great idea!! tried your salted caramel recipe today- LOVE IT! I’m so happy to hear this!! You’re so welcome! I just made this and am wondering why it’s really light in color. It’s like a tan color. Should I have cooked it longer? I followed your directions exactly. Do I need to refrigerate the coconut milk and only use the solids? or can i use all of it? Yes. you need the solid parts! You don’t want the coconut water part at all, only the full fat. This worked very well for me and tasted quite nice. Ive made it twice in the past week. However, at a simmer as stated in the directions it took nearly an hour to thicken the first time. I watched the video afterwards and would definitely recommend, for those who tried this and couldn’t get it to thicken after 15 minutes, turning up the heat and letting it boil gently. I did this the second time and it thickened in about 20 minutes. Oh I’m so happy to hear this!! Happy New Year, and you’re so welcome!! Looking forward to trying your recipe. How much do you pack the brown sugar when you measure it out? Thanks! We had crystals with the recipe as written. Had a good result substituting some agave nectar for some of the sugar. Also, wondering how much your recipe usually yields for you. i would be using regular granulated sugar for making this vegan caramel. do i need to caramelize the sugar like we do while making regulr caramel before adding the coconut milk. or should i use brown sugar? Thank you for this recipe! It was absolutely delicious and so easy to make! I added a little vanilla at the end of cooking. Hi! Thanks for the positivity on this recipe! We’re glad you like it! I made this and it came out amazing!!!! I tried again, and I guess there was too much water from the coconut cream can, and it isn’t coming together, any save for this? Thanks so much! I’m so happy to hear that!! Hmm, is it separating or just not as thick? Thanks so much for your quick reply! Yes, it’s separating. I would remove it from the heat, maybe let the excess drain off, then try to stir it constantly, and smoothly until it comes back together, than gradually return it to the heat. I haven’t had this happen to me, but yes it sounds like it was maybe too watery! I hope that helps! If i want to make the caramel thicker do i just add more sugar? Will this caramel recipe be ok to make caramel decorations? I haven’t tried to make caramel decorations with this, but I do suspect that if you let it cook much longer then it would definitely make like soft caramel, like a toffee consistency (maybe cooking down for at least 30 minutes). I’m not sure if adding more sugar would make a difference since I haven’t tried it! Hi, I have a couple of questions, if possible. 1) Is it possible to make this thicker than in the images? I’m hoping to use this as a filling for vegan macarons. 2) Can I use alternative double cream, like soy cream? I’ve managed to track some down in a local supermarket. If you let it cook for much longer, maybe 10 to 20 minutes longer, it might thicken up more. I haven’t tried it so can’t verify, but I did cook it a bit longer one time and it was thicker so I think more time would help with that. Just watch it so it doesn’t burn. I’ve never used soy cream but soy is an amazing thickener (I use it in my vegan mayonnaise) so I think it would definitely work! I hope that helps! Cook it for 15 to 30 minutes longer, watching carefully! So happy you enjoyed and thanks for sharing your additions!! It came out light grey. How did you get that rich caramel color? Also the can of full fat (“classic” ) coconut milk had 3/4 cup of solid whites in it. Have they reduced can sizes? So far it tastes good. I’m waiting for it in the refrigerator! I hope it turned out! Yes definitely looking like they have reduced the solid amounts per can! But mine didn’t turn out light grey, and I made it last week. What kind of sugar did you use? I just made this as a topping for shortbread and it worked brilliantly! It is so delicious. I used half dark brown muscavodo sugar and half golden caster sugar and cooked it until the temperature was about 115C. Thanks for such a fab recipe! This looks perfect for my apple dipping bar I’m going to have at my bonfire party next weekend! One question…when using the canned coconut milk, do you mix the fat and the water or just use the fat? Thanks! Just use the fat! You don’t want any water in this at all! I hope you enjoy!! About ¾ cup to 1 cup of thick sauce! This was truly amazing. Due to dairy and corn allergies in have not had caramel in years. This was better than I remember! Plan to make an apple crisp and drizzle this over (who am I kidding? It will definitely not be a drizzle!) For Thanksgiving. Thank you!! Aww I’m so so happy to hear that Laura!! I hope you enjoy so much over your desserts and have a happy Thanksgiving!! P.S. it’s amazing on ice cream too! Thank you for this recipe. I am doing a conversion to vegan for an original dessert in my nutrition class for my culinary program. I will be making modifications so it matches my other recipe (like adding coffee and vanilla but I wanted to let you know that I’m giving you credit for the caramel base of the sauce. I hope it turns out well. I will try to write back and let you know. That’s so great and I hope it works out well for you! It makes about ¾ cup – I just keep forgetting to add it in when I make it! Enjoy and good luck and thank you for giving me credit! This caramel sauce is delicious! I am pleasantly surprised by the great taste of vegan caramel. While it was simmering in the pot, I made sure to brush the sides of the pot with a little bit of water, with a pastry brush, to prevent sugar crystals from forming. I would also recommend doubling the recipe, that will yield a small jar of caramel sauce. 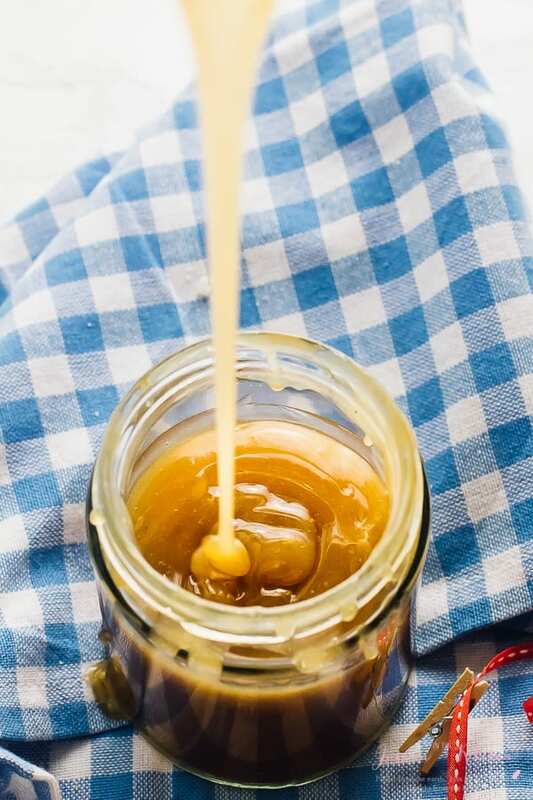 If you’re gonna make homemade caramel, which is a bit more time-consuming than store-bought, you might as well make more 🙂 Thank you for sharing this great recipe. So happy to hear that!!! You’re so welcome and I agree double of this recipe is always a great idea! Also love your tip re brushing the sides with a pastry brush!! I just discovered your blog – In love with your photos, stories, and recipes. 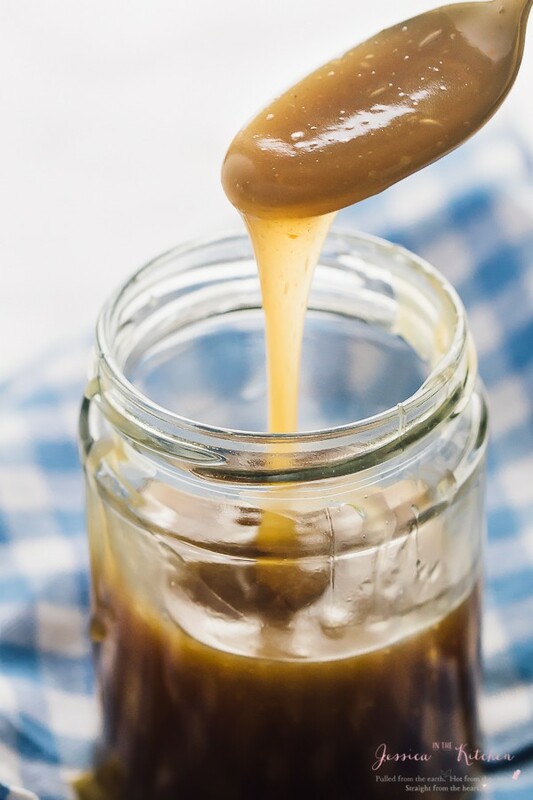 This caramel sauce is to die for – so easy and rich with coconut sugar. I have added different spices to change up the flavor for fun, but there has not been one person that has come to my house for coffee that has not fallen in love with this caramel sauce. Thank you! Hi Heather! Stories like this warm our heart. We’re so happy that you’re able to share this recipe with friends and that you enjoyed it as well. Thank you for trying our recipe! I make homemade caramel as a special gift at the holidays, but my boss is vegan, so I tried this recipe. While it is delicious, it doesn’t taste anything like caramel, but rather tastes like a very sweet coconut sauce. Did you try making it using the traditional method of caramelizing sugar with water and a tiny bit of lemon juice, then adding the coconut milk? Hi Margie! Thank you for commenting. We’re sorry you were not as satisfied with the caramel taste as we are. Trying the method you mentioned may cause crystallisation. If you do try we would be happy to hear how it turns out! Thank you so very much….I had a craving for caramel this afternoon to have with Digestive biscuits. I had all the ingredients using the creamed coconut I’d created as double cream over Christmas (been infused cinnamon, cardamon and vanilla. A little cocoa and I’m super excited about how this caramel fusion will be with my cup of tea. Thank you in advanced. You’re so welcome Natasha! We really hope that you enjoyed this recipe! It’s super delicious, but mine came out tan in color and then separated in the fridge. Any idea why? I used full fat coconut milk from the can, brown sugar, and sea salt. Hi Erin I’m so sorry it didn’t work out perfectly for you. I want ask this so we can solve this issue together. Did any of the coconut water from the can get into the sauce when making it? Hmm. The only other thing I can think of is the cooking time ( It separates when it is heated too long) or a not up to snuff batch of coconut cream. It sounds like you did a great job sticking to the instructions. My only suggestion would be to try a different brand of coconut milk. The one we use that we found to be pretty consistent was the Thai kitchen coconut milk https://www.amazon.com/Thai-Kitchen-Coconut-Milk-13-66/dp/B000GZSDZI . I hope this was somewhat helpful. I figured it out. I didn’t cook it long enough. In my worry to not overcook it, I undercooked it. Thanks so much for the help though. My daughter loves caramel but has developed a bunch of allergies this past year. She is loving being able to have good tasting caramel again. My teenage daughter needed to bring a vegan dish for a potluck with friends tonight. We decided to make this for a dip with Granny Smith apples. I used regular sugar which I caramelized before adding the thick coconut milk. The sugar ended up seizing this way but I just kept stirring at a low boil and it dissolved turning out delicious. This was my first time using coconut milk. One question though – any recommendations on what to do with the thin coconut milk left from the can? Hi Jody I’m glad you enjoyed our recipe! You could definitely add it to a chickpea curry recipe or our tikka massala recipe. I hope this helps! Do you think i could make chocolate carmel eggs out of these if put chocolate in egg moulds and fill them with the carmel? Would it be thick and gooey enough? Hi Meadbh you could definitely use it in you chocolate caramel eggs. They would definitely be thick and gooey enough. I hope this helps. Let me add that if you want it thicker, you can also cook it down for an extra 10 minutes! So after googling a recipe came across this. Now I didn’t have any coconut milk in my cupboard and only a small amount of brown sugar. I only needed a small amount for my pancakes and I did have some soya cream, so I used 3 level desert spoons of brown sugar to 4 desert spoons of soya cream and the result – Amazing caramel sauce 😀 Happy pancake day! Yay! That’s so amazing and I’m so happy to hear! Happy Pancake Day to you too!! I’m not on a paleo or vegan diet but my family needs a sugar with a lower GI, and coconut sugar is my best option. What do you think I could use other than coconut milk? I’m honestly not sure what else would work here other than coconut milk, since the fat from it is needed for this to thicken up like dairy caramel sauce. Sorry I couldn’t have been more help! I used this recipe in order to make banoffee pie for my vegan daughter. She loved it and I was amazed how easy it was to make. Thank You. Thank you so much for reading and leaving a positive review Sally. We feel really happy that you were able to use this to make a dish for your daughter.